PBIS Bullying from King Arts MS on Vimeo. Check out this great video about our Dance program and the use of technology in the Arts. STEAM is alive and well at King ARTS. The Science of Dance from DigitalPromiseStories on Vimeo. King Arts is the 2016 Arts Innovation Award winner from the Arts Schools Network. We were recognized for our work with The Center for Community Arts Partnerships at Columbia College Chicago. We have been partnering with Columbia College and their Project AIM (Arts Integration Mentorship) program for the past 12 years to strengthen our arts integration and enrichment programs at King Arts. To learn more about Arts Schools Network click on the link below. To learn more about our work with Project AIM click on the Arts-Integrated Learning section of our menu on the left. 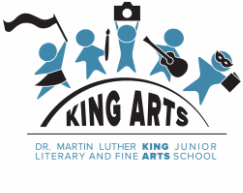 King Arts is a K-8 magnet school in Evanston, IL, honoring the legacy of Dr. Martin Luther King jr..
​ We offer Dance, Media & Visual Arts, Drama, Vocal and Instrumental Music. Our mission is to provide all students with a dynamic educational experience that focuses on the fine and performing arts and emphasizes literature and writing. The Importance of Fine Arts at King Arts from Chute MS & King Arts Lab MS on Vimeo.